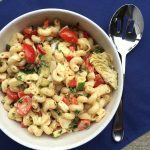 If you’re looking for a simple and flavorful pasta salad recipe to feed a crowd then you’ve found the perfect option in Company Pasta Salad. Featuring fresh vegetables, fun pasta shapes, and a classic dressing, no picnic or party is complete without this fuss-free side dish on your table. Use this recipe as a roadmap and then customize to include fresh vegetables and herbs, a different flavor dressing, or another shape of pasta. My mother makes the BEST pasta salad and even though I’ve tried really hard to recreate hers in this recipe, I still don’t know if I did it justice. Granted, she gave me the roadmap for her recipe so I’m hopeful that it will taste similar with its own unique characteristics. You know though, there’s just something about food that someone else makes for you that just has that special dose of love that you can literally taste that can’t always be recreated. At least that is how I feel when I eat any of my mom’s recipes–spaghetti sauce, soup, etc. Maybe this pasta salad recipe (that feeds a small army btw) will be yours for someone else. 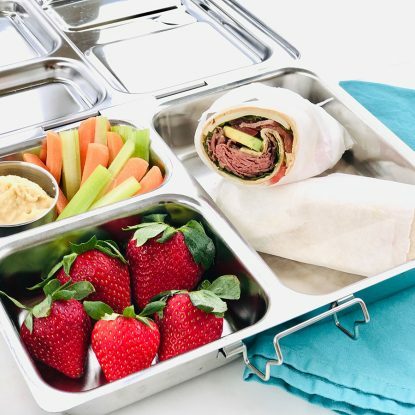 Today, some of the mothers from Frances and Ellie’s Mother’s Day Out program and I wanted to treat the sweet teachers that so lovingly and selflessly care for our children each day to a homemade lunch. Because this pasta salad recipe makes around 25 cups (give or take a few depending on which vegetables you include, the size of your pasta, etc. ), I thought I would include it as part of the menu. Make ahead: Prepare the recipe the day before and let it sit in the fridge to marinate. This isn’t required but I always find it tastes better the next day. Feeds a crowd: The more goodies you add, the bigger the pasta salad gets! This particular recipe makes 25 cups but add another chopped bell pepper, some chopped carrots, and some olives and we’re up to 26 cups. Affordable: In-season produce and noodles are both very inexpensive, especially if you grow your own veggies. Use what you have on-hand versus buying ingredients exactly as called for here. Do you have a favorite recipe to feed a crowd? Share it with me here! I know we’ll be having lake gatherings with friends over the summer so I’ll be looking for recipes that make large portions. Once pasta has cooled, add pasta to bowl with other ingredients. Toss together. Whisk together dressing and Dijon mustard. Using a large spoon (or your hands), toss ingredients together. 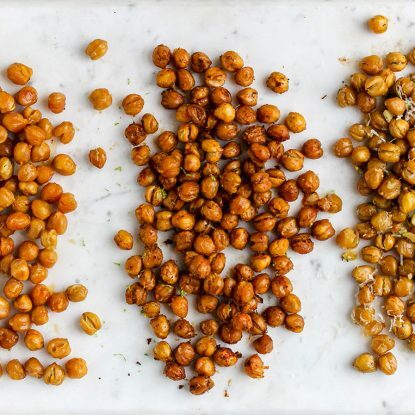 Refrigerate at least one hour (or overnight). Stir in basil before serving. *Note that I used T. Marzetti Champagne Vinaigrette but Ghirard's is also a favorite. My mom swears by Marie's Creamy Italian as a delicious option. If you're looking for a simple and flavorful pasta salad recipe to feed a crowd then you've found the perfect option. Featuring fresh vegetables, fun pasta shapes, and a classic dressing, no picnic or party is complete without this fuss-free side dish on your table. Use this recipe as a roadmap and then customize to include fresh vegetables and herbs, a different flavor dressing, or another shape of pasta. Perfect! Thanks for letting me join! I am big into entertaining and what Liz calls “vat cooking” so this is a perfect recipe for me! Love the artichoke hearts and, of course, the cubes of cheddar! I love that term! Yes, it is so good to have a few recipes like that in your arsenal for when you’re cooking for a crowd. 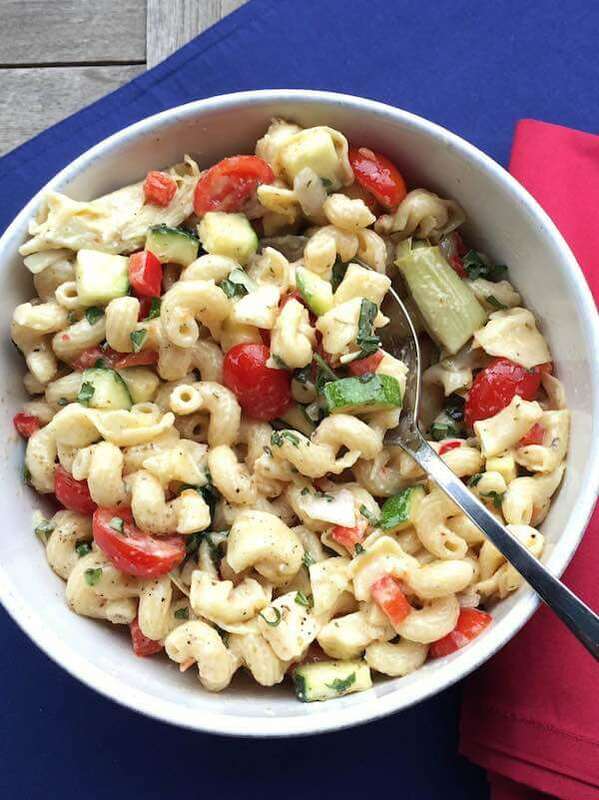 This pasta salad is always one with our group. They did! It was fun to celebrate them–they have the most loving teachers! 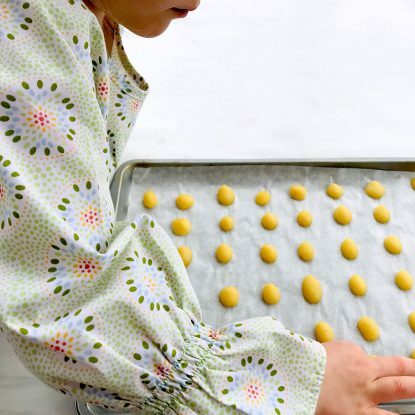 I can totally relate to recreating your mom’s recipes and them just missing something. I have the same thing with some of my mother’s recipes that I just can’t get the same! This pasta salad looks great though!! Thank you! It is so simple and can easily be adapted to what you have on-hand! Hey Holley! I made your company pasta salad for Mother’s Day this past weekend, and it was a delicious hit! Thank you for this recipe! I’m so glad you enjoyed it! It is the perfect recipe for a picnic or when feeding a crowd (or both! ).